Easy-Up 6-in-1 Youth Goal by Bison, Inc.
Attaches to Existing Rim. 6 RIM HEIGHT SETTINGS WITH THIS ONE MODEL - 6-1/2', 7', 7-1/2', 8', 8-1/2' and 9'. Institutional Grade! Over 100,000 Easy-Up Youth Goals are in service in youth camps, YMCA's, YWCA's, elementary schools, church recreation centers, basketball camps, city recreation facilities and others. Shop around and compare these features. 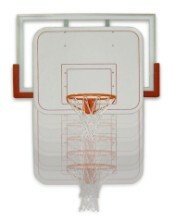 BACKBOARD: 48" X 32" molded high impact ABS plastic Light and strong with a lifetime warranty. MOUNTING STRUCTURE: Heavy tubular steel frame designed to fit on an existing 10' rim using a unique cam operated lever. The Easy-up also moves the rim 24" closer to the free throw line for regulation youth play. One person can easily attach the Easy-Up standing on a small ladder or chair. Rim height can be easily set at 6 different heights in less than five minuets with no tools. 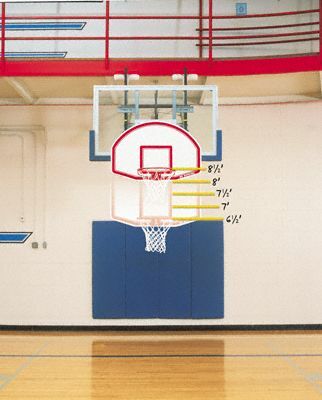 The rim height can be set at 6-1/2', 7', 7-1/2', 8', 8-1/2' and 9'. Please call us if you have any mounting questions! Weighs 45 lbs. FULL SIZE RIM: Institutional Grade full size goal with Bison's hand-welded metal net attachment system, no plastic net clips on this rim. The rim folds up for storage and transport. Folds up for storage or transport! Need more than Two? Call or email us for incredible discounts on multi-unit purchases. INCLUDES: FREE SHIPPING and Lifetime Warranty. Free Shipping right to your curb. This unit is IN STOCK and normally ships in 24 hours with an average delivery time of 4 to 5 days. Shipping weight is 50 lbs. "Limited Time Offer: Free Shipping"
2 - 3 Save $10.00 ea. 4 - 5 Save $20.00 ea. 6 - 8 Save $30.00 ea. 6-in-1 Adjustable Youth Goal that Attaches to Existing Rim. 6 adjustable rim height settings from 6-1/2' to 9'. Institutional Grade. MADE IN THE USA!